as lorelai gilmore once said "with tater tots i can just rip and dump." this isn't tater tots (tho i do eat those on a near weekly basis) but it's pretty much rip and pour. i claim to be a big fan of crock pot cooking. i say "claim" because tho i'm a "fan" i don't cook crock pot meals very often. the main reason is that the 8-6 hour cooking time isn't always convienent. i have to have this cook overnight and if i'm just a few minutes late putting it on, morning ruined. i really shouldn't blame the crock pot, it's poor planning on my part really. while this smelled really good while it was cooking, it didn't taste that great. 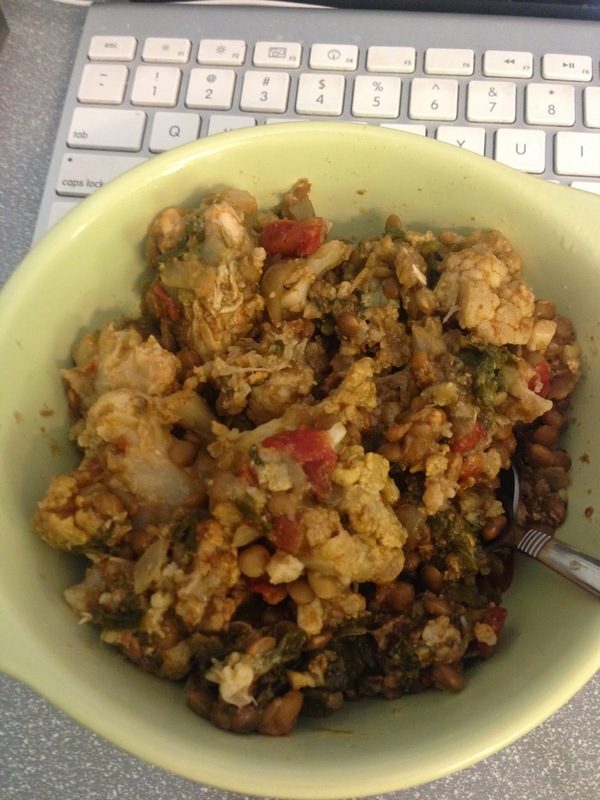 the spices got lost in the mix and it basically tasted like lentils and cauliflower. i ended up adding more spices to it when reheating. everything was really tender after cooking, the chicken fell apart beautifully.